Hiriko is a city car concept developed by MIT and named after, predictably, the Basque word for "urban." With "robot wheels" at each corner incorporating independent motors, suspension, and control systems, the car has more in common with the Mars rovers than conventional cars. The car can collapse its wheelbase/length from 100" to 60" to allow it to be parked nose-to-curb. Some sites claim that, in compressed form, it's the world's tiniest car. It's not, as you can actually buy a Peel P50 (albeit for way too much money) and that's only about 47" long. The collapsibility, while absolutely cool, is not unique to the Hiriko, either. Way back in 1951 the French were concerned about cramped city life, and the Reyonnah was there to help. The Reyonnah was a 8.5 HP microcar that featured a unique front suspension that allowed the car to collapse into a very narrow package. When collapsed, the car could be parked in motorcycle spots or even placed in the lobby of a Parisian apartment building. It never really caught on, but it's fun to crush the dreams of brilliant people who think they came up with something entirely new. Because jealousy. And actually, even before the Reyonnah, in 1929 Engelbert Zaschka came up with his own crude folding car, though to be fair it was more of a rapidly-disassemble-able car, complete with a snap-on jacket-like leather body. Back to the Hiriko. 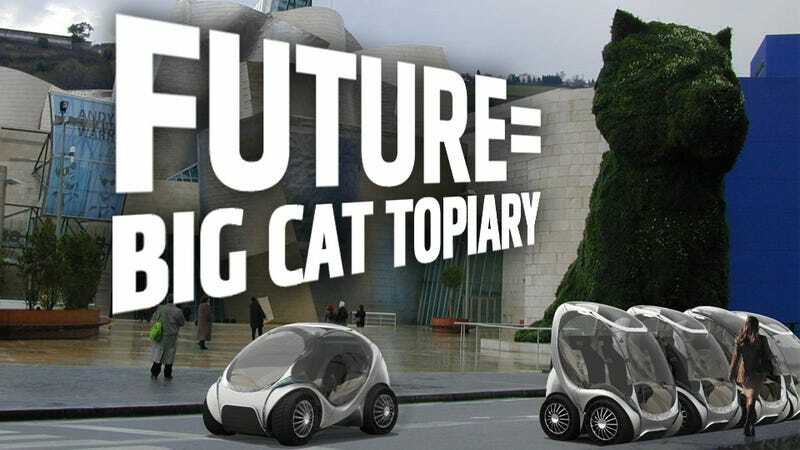 The cars, which are planned to have a roughly 75 mile range and 30 mph top speed, are envisioned as more part of a larger system of intra-city transportation than personal vehicles, and wouldn't likely be privately owned. People would use them as needed from a city-wide fleet. As a result they would likely make both public transport much more convenient as well as providing a city's horny teen population a semi-private place to dry-hump. And as exciting new mobile graffiti platforms, possibly. The technology is impressive, and the Isetta-like front-door design seems quite good. In a big city where car ownership can be odious, the Hiriko concept may prove a good compromise.